In the animal world and zoo world, that is the same but in Greek cultism, being an "alpha" male means being the roughest and strongest of the group, accumulate a greater quantity of testosterone and have the fastest and most aggressive sperm and consequently have the exclusivity of junction with the females. In the "homo" gender it is not irrelevant and value to be an "alpha male" in the zoo sense, but the sapiens has many and varied areas of interest in addition to the primary desire of junction. Eratóstener was a curious and wise character in Greek Antiquity. He was born in Cyrene circa 276 B.C. and he died in Alexandria in 194 B.C. He lived in Alexandria, where he was director of the famous Library, about which I have dealt extensively in this blog. He was a wise mathematician, geographer, astronomer, philosopher, historian, poet, musician, etc. According to Suetonius, he was the first who called himself as “filologus", a philologist". Among its achievements, which have been left to posterity, it is the famous "Sieve of Eratosthenes" or mode and stencil to find prime number and especially the measuring of the circumference of the Earth with minimal error. It is allocated to him the famous work Catasterisms, which explains 44 constellations of the visible from Greece sky. The work, as it has been transmitted quite schematic, it is not yours, but he must well have been the author of a larger work which is today a mere relic summary for students. He wrote three books on Geography, in which he exposed his measurement of the circumference of the earth, explained below. He is also author of a Chronography from the Trojan War to Alexander the Great, on reference to the celebration of the Olympic Games in honor of Zeus. 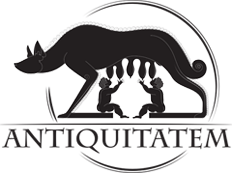 He wrote the "Platonic" dialogue relating the music to mathematics; also he wrote an essay on the cub duplication; an epic poem called Hermes, the elegiac poem Erigone; an extensive work on Old Comedy and the famous mentioned above treatise “Catasterisms”. Well, Eratosthenes was not for his contemporaries an "alpha" but a "beta" and with these nickname he was called and this not because he was a scholar and second category scientist, but because it was "the second" in all categories and topics of in question. Anyway, just the gentle reader may compile clearly a long list of men "beta", of second men, whom mankind is indebted for their many positive contributions. They had the wisdom and intelligence to leave the first place, the "alpha" place ,for absolutely expendable people. Son of Aglaus (others say Ambrosius); of Cyrene. A pupil of the philosopher Ariston of Chios, the grammarian Lysanias of Cyrene, and Callimachus the poet. Ptolemy III summoned him from Athens, and he lived until Ptolemy V. Because he came second in every branch of learning to those who had reached the highest level, he was nicknamed 'platforms', βήματα  Others called him a second or new Plato, or the 'pentathlete'. He was born in the 126th Olympiad,[276-273 B.C] and died aged 80, giving up food because of his declining eye-sight. He left a distinguished pupil, Aristophanes of Byzantium, whose pupil Aristarchus was in turn.His pupils were Mnaseas, Menander and Aristis. He wrote philosophical works, poems and histories; Astronomy, or Catasterisms; On the Philosophical Sects; On Freedom from Pain; many dialogues; and numerous grammatical works. βήματα , a mistake for βῆτα (the second letter in the alphabet). His measurement of length of the diameter of the Earth with minimal error, without satellites, radar, telescopes and other modern props, is the result of an intelligence which continues to fascinate us. Definitely it deserves a little explanation. It is told that reviewing one day a papyrus of Library, he found that it said that on June 21, in the spring solstice, in Siena, near the first cataract of the Nile Egyptian city, at noon you could see the water in fund of the wells and vertical poles did not shaded because the sun was at its zenith. Eratosthenes recalled that this day in Alexandria obelisks shaded shadow forming an angle of 1/50 of a circle, ie, 7.2 ° (degrees). As the sun was far from the earth, the sun's rays impinged parallel sites. Knowing the distance between Alexandria and Syene was 5,000 stadia, about 800 kms, it was concluded that the share of 7.2 ° (degrees) away; inasmuch as the earth's circumference is 360 degrees, he concluded that the length was 252,000 stadia, equivalent to about 41 142 kms. He was wrong on a percentage laughable. The length in ecuador with today's precision is 40,076 kms. If two parallel straight lines are transected by a third line, the alternate interior angles are equal. 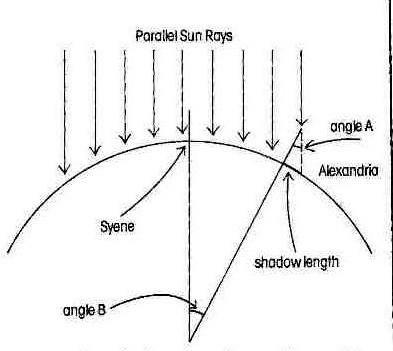 Angle B equals angle A; so the length from Alexandria to Syene was 7,2º, about 800 kms.